The former UK Independence Party (UKIP) leader Nigel Farage said he was "lucky to be alive" after his plane crashed in Northamptonshire. The aircraft came down at Hinton-in-the-Hedges Airfield near Brackley. 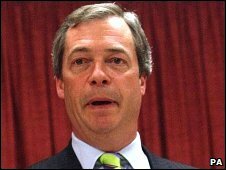 Mr Farage is being treated at John Radcliffe Hospital in Oxford for broken ribs and other minor injuries. Pilot, Justin Adams, is also in hospital. It is thought the aircraft came down when a trailing campaign banner became entangled. Party leader Lord Pearson said Mr Farage had been visited by his wife in hospital. He said: "Despite being in considerable pain, we deduce that Nigel is back to something like his normal form. "We also understand that the injuries to the pilot, Justin Adams, may be less serious than previously feared though we have been unable to speak to his family. "It is clear that both men had a remarkably lucky escape." A spokesperson for UKIP said "it was unlikely Mr Farage would be discharged from hospital today". He added: "He (Mr Farage) suffered facial cuts and bruises and injuries to his chest and there might be some damage to his ribs." A consultant at the hospital is reported to have told a UKIP press officer that Mr Farage may also have suffered a chip to his spine. Chris Adams, UKIP parliamentary candidate for Aylesbury, earlier said Mr Farage had been "in and out of consciousness" and had been X-rayed but the press officer later said they had been told he was conscious throughout the crash and rescue. The aircraft was due to circle over Buckingham, where Mr Farage is standing as a candidate, trailing a banner, a UKIP spokesman said. Mike Jose, Mr Farage's assistant, said they had previously flown the plane and banner over the constituency without any problems. Surveying the mangled metal of the aircraft, Det Ch Insp Martin Kinchin, of Northamptonshire Police, said: "I think you can make your own judgment as to how lucky they were. Describing how the crash happened, he said: "It is our belief that the plane had recently taken off from here and was manoeuvring back to the airfield." 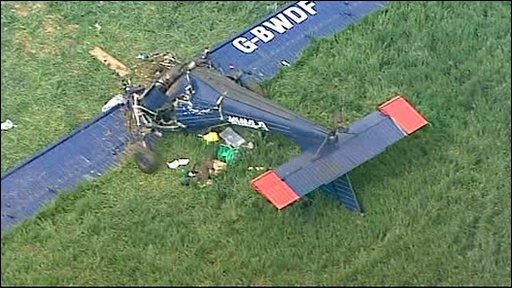 When asked if the UKIP banner had become tangled in the aircraft, causing the crash, he said it was too early to speculate. The white banner, which landed several hundred metres from the plane, had been attached to it previously, he confirmed. A UKIP spokesman said the pair were trapped in the plane hanging upside down after the crash, but were "talking, conscious and breathing" during the rescue operation. Mr Adams, who is also Mr Farage's campaign manager, said: "Apparently the plane nose-dived. We had a banner attached to the back of the plane which basically got wrapped around the tail. "The pilot had sent out a May Day signal and it basically crash dived. It's all a bit of a shock, especially on polling day." The airfield has now been closed and the crash is due to be investigated by the Air Accident Investigation Branch, Northamptonshire Police said. Mr Farage is a Member of the European Parliament, representing South East England.